Ocean Princess Video Slot Guide & Review - Casino Answers! 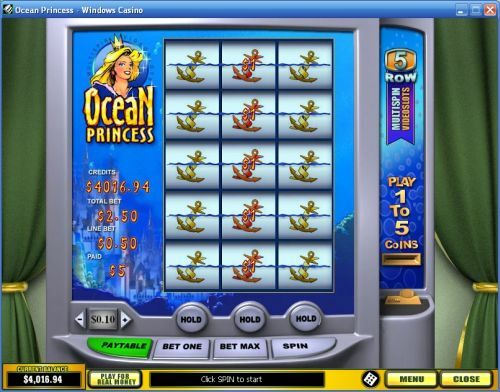 Ocean Princess is a 3-reel, 5-row multispin video slot developed by Playtech, featuring a wild symbol and a hold feature. 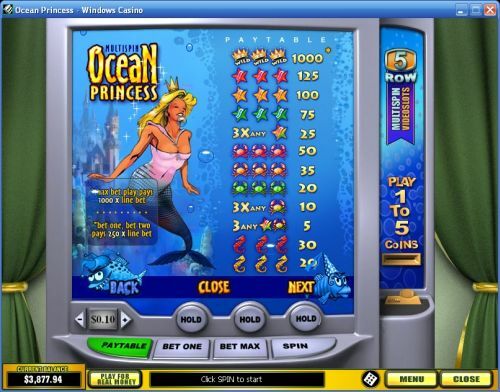 You can play the Ocean Princess multispin slot game at Bovada. Ocean Princess is a 5-row multispin video slot. As such, it is as if you are playing five different 3-reel classic slot machines. Coin values available on the Ocean Princess slot machine are $0.01, $0.05, $0.10, $0.25, $0.50, $1, $2 and $5. You can then play from 1-5 coins per spin, which you can select by using the “Bet One” button. Once you have selected your bet, you can either hit “Spin” or “Bet Max” to spin the bottom row of the slot machine. Regardless of how many coins you play, all 5 rows are always enabled on the Ocean Princess video slot. After you have made your initial spin, you can choose to hold any or all of the positions on the bottom row. If you don’t wish to hold any, simply hit “Spin” once again. You will be paid out for each winning combination you get on any of the 5 rows. The highest paying symbol on the Ocean Princess slot machine is the Crown symbol. If you hit 3 Crown symbols on a row in the Ocean Princess multispin slot when playing the maximum bet, you will win the 1000 coin top jackpot. When not making the maximum bet, you will only be paid out 250 coins, which is why Casino Answers recommends that you play the maximum bet at all times on the Ocean Princess slot game. The Crown symbol is a wild symbol and will substitute for all other symbols in winning combinations. The Crown symbol is the most valuable symbol on Ocean Princess and one you should look out for when you play it at Bovada. There are 23 winning combinations on the Ocean Princess multispin video slot. The full payout schedule is as follows: 1 Turtle symbol (1), 1 Crown symbol (1), 2 Turtle symbols (2), 2 Crown symbols (2), 3 of any Anchor symbols (2), 3 Turtle symbols (5), 3 Green Anchor symbols (5), 3 of any Seahorse symbols (5), any/Starfish/Crab (5), 3 Yellow Anchor symbols (10), 3 Green Seahorse symbols (10), 3 of any Crab symbols (10), 3 Red Anchor symbols (15), 3 Yellow Seahorse symbols (20), 3 Green Crab symbols (20), 3 of any Starfish symbols (25), 3 Red Seahorse symbols (30), 3 Orange Crab symbols (35), 3 Red Crab symbols (50), 3 Green Starfish symbols (75), 3 Orange Starfish symbols (100), 3 Red Starfish symbols (125) and 3 Crown symbols (250/250/250/250/1000). For a look at the higher end of the Ocean Princess payout schedule, we have a screenshot of the paytable below. For those who are looking for a change of pace with a different type of slot machine, Playtech delivers with this multispin slot. In writing, it may be a little difficult to understand for some, but in practice you should get the hang of it very quickly. To play the Ocean Princess multispin video slot, sign up and deposit at Bovada! Can players from the United States play the Ocean Princess video slot? Unfortunately, American players cannot play the Ocean Princess online slot game for real money at this time. For mermaid-themed slots that are USA-friendly, please read our Ocean Treasure Video Slot Review and Mermaid Queen Video Slot Review. Can I play a Flash game of the Ocean Treasure multispin slot for free? Yes, you can play an Instant Play version of the Ocean Treasure slot at Bovada. You can play for free or real money. If you have difficulties playing, you might want to try installing the latest version of Adobe Flash Player. What other multispin slots are available? You can also read our Goblin’s Cave Multispin Slot Review and our Tropic Reels Multispin Slot Review. Both of these multispin slot games can be played along with Ocean Princess at Bovada. Where can players from the USA play multispin video slots? If you’re from the United States of America, there isn’t much in the way of multispin online slots that you can play. The only one we are aware of at this time is called Megaspin and it is found at the USA-friendly Slotland Casino.